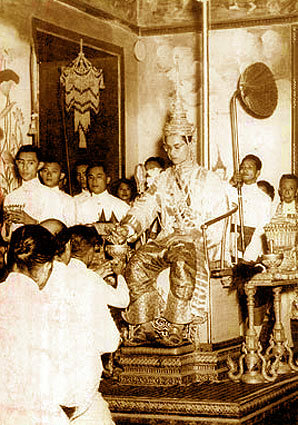 The coronation of His Majesty King Bhumibol Adulyadej took place on 5 May 1950. His Majesty is the ninth King of the Chakri Dynasty. On 5 May of every year, the Thai people rejoice and express their affection and loyalty to him by organizing a celebration on his coronation day. Prior to the reign of King Rama IV (King Mongkut), there was no coronation ceremony in Thailand, there was only private ceremony held by high ranking officials to celebrate their Royal Regalia and positions in the 6th lunar month. A coronation, however, took place for the first time when King Rama IV was crowned on 15 May 1851. King Mongkut thought that the Coronation was an auspicious occasion but thought that it would be dificult to explain the meaning of the coronation day to his subjects in detail, he thus called this day as a “ceremony to commemorate the Royal Regalia” but was quite similar to that of a coronation. On that day (the 13th of the full moon in the 6th lunar month), following day monks were invited to have meal at the Dusit Maha Prasart Throne Hall in Grand Palace.During the reign of the present king, the ceremony is performed for three days. The first day falls on 3 May in which the following ceremony will be performed; the king performs a merit-making ceremony at the Audience Hall of Amarindra in dedication to the deceased kings while Buddhist monks chant, give a sermon and perform a requiem on the royal ashes of the deceased kings. On 4 May, the Coronation Ceremonies begin with the proclamation of the Coronation Day read by the Chief of Brahmin priests followed by an evening chanting performed by Buddhist monks. Finally, 5 May is the actual date of the ceremony in which food is to be offered to monks and followed by a celebration of the Royal Regalia. At noon the Army and Navy fire a 21-gun salute in honour of the king. On this day, His Majesty the King also presents the royal decorations to the people who have made a valuable contribution to the country. The Royal Anthem (เพลงสรรเสริญพระบารมี pleeng săn-sĕrn prá-baa-rá-mii) is played on this day. We, servants of His great Majesty,prostrate our heart and head,to pay respect to the ruler, whose merits are boundless,outstanding in the great Chakri dynasty,the greatest of Siam,with great and lasting honor,(We are) secure and peaceful because of your royal rule,results of king cure(is) people in happiness and in peace,May it be thatwhatever you will,be doneaccording to the hopes of your great heartas we wish (you) victory, hurrah! Note: the royal anthem is also played before the beginning of each film in movie theatres, as well as before the commencement of the first act in plays, musicals, concerts, and most other live performances of music or theatre in Thailand. Is the anthem the same song played throughout Thailand in public places at 6:00 PM. I was hoping you could redo this page, where the english translation you can ‘break down’ the meaning of each of the lines of the anthem. The translation you provide isn’t the same like you do with most lessons where you break down the meaning of the words. The translation above seems somewhat confusing. Or do another article where you break down the meaning of the royal anthem further. And also break down the last phrase: ทรงพระเจริญ long live the king. 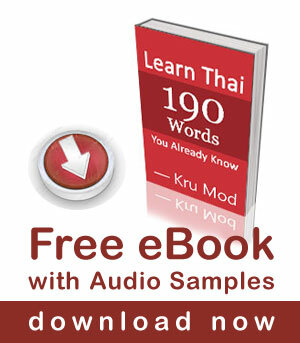 Regarding my previous question, does “http://www.thai-language.com/id/214860” use the wrong spelling for “วันฉัตรมงคล” or is there more than one way to spell the term?